The Annual Bishop’s Dinner was organized in the year 2000 by Lady Virginia Zamboni and a dedicated group of volunteers she named the Honorary Committee. The goal of the dinner then and still today, is to bring people together to pay tribute to the Most Rev. Bishop Gerald R. Barnes who is a model of hospitality and service . . . always ready to welcome the stranger and to minister to those in need, especially the most vulnerable among us. Funds raised at the dinner support the mission and the future of the Church in the Diocese of San Bernardino. Two years later in 2002, Bishop Barnes discussed the need to recognize those who had provided significant leadership in improving the lives of people in the counties of Riverside and San Bernardino. The addition of the Amar Es Entregarse Awards to the evening’s program allowed Bishop, as shepherd of the Diocese, to extend appreciation and gratitude to persons who give extraordinarily of their time, talent and treasure to the Church and the community. 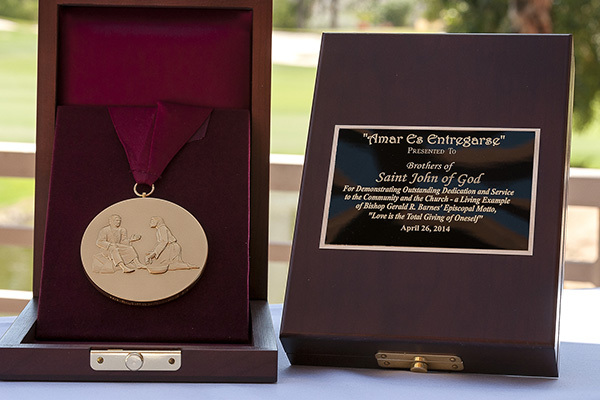 A medallion struck, of Jesus who is washing the feet of his apostles, is selected by Bishop to present to each honoree, because it best represents his Episcopal Motto: Amar Es Entregarse, “Love is the Total Giving of Oneself”. In using this symbol Bishop emphasizes the roots of his ministry to the people of God, taken from the Gospel of John, “As I have done, so you must do”. Since 2002, 82 community and Church leaders have been recognized. One of the most frequent remarks made by those attending the event, has been that they are so proud to be a part of such an elegant and large gathering, which comes together annually to recognize friends and to support the Church. There is another wonderful and intangible benefit . . . this is the starting point for many to become more actively involved in the work of the Diocese. 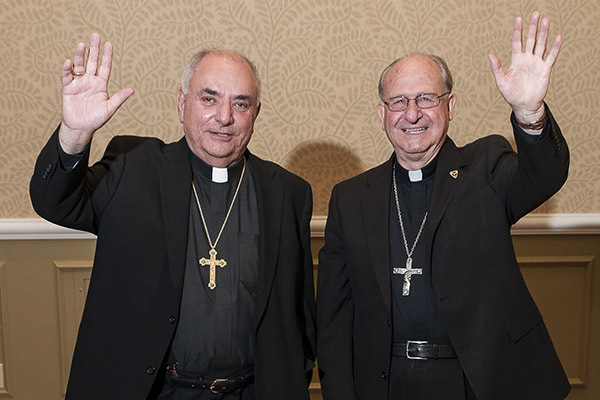 We extend an invitation to you to attend the Annual Bishop’s Dinner. The Bishop’s Dinner brings together people from all corners of our Diocese; please join us for an evening of fun as we honor: Most Rev. Rutilio del Riego, Our Lady of Victory Missionary Sisters, Sisters of Mercy with the Amar Es Entregarse award. In this year when we celebrate the year for consecrated life, Bishop chose honorees who represent religious communities. All proceeds of the Dinner will be directed to Bishop del Riego’s Seminarian Scholarship Endowment. Invitations will be mailed late February or early March. Our guest list seating is first come, first served. Table of 10 is available for $2,500 (table name will be listed in the program) or $250 per seat.